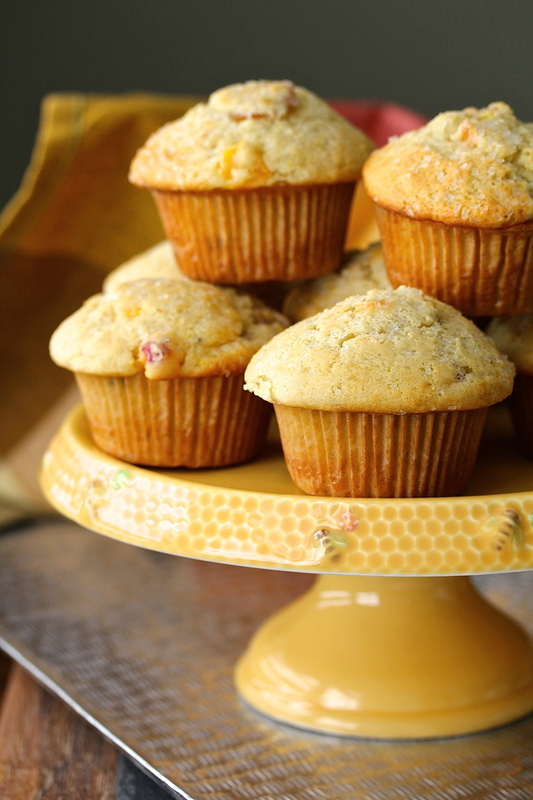 These Fresh Peach Muffins are light, fruity, and just a little sweet. They are the perfect summer breakfast treat. I love the peachy flavor of these muffins. The peaches are slightly mashed to release just enough juices, yet, there are still plenty of peach chunks in the muffins to remind you that there are, indeed, peaches in them. Even though I live in California, for many years it was difficult to find really good juicy fresh peaches or nectarines. Other stone fruits such as cherries, plums, and apricots were fine, but peaches and nectarines? Not so much, unless you grew them in your own back yard. I wish I knew why. Fortunately, with the "locally grown" movement, along with the growth of Asian markets in our area, locals will no longer put up with hard or mealy fruit. You don't even have to go to farmers markets to get fresh peaches. How cool is that? I found some luscious fresh peaches, which I incorporated into these muffins, skin and all. I diced the peaches, and then very lightly mashed them with a granny fork. It's one of my favorite tools to roughly mash foods such as hard cooked eggs, potatoes, as well as mix and blend ingredients. No worries, you can also use a dinner fork. 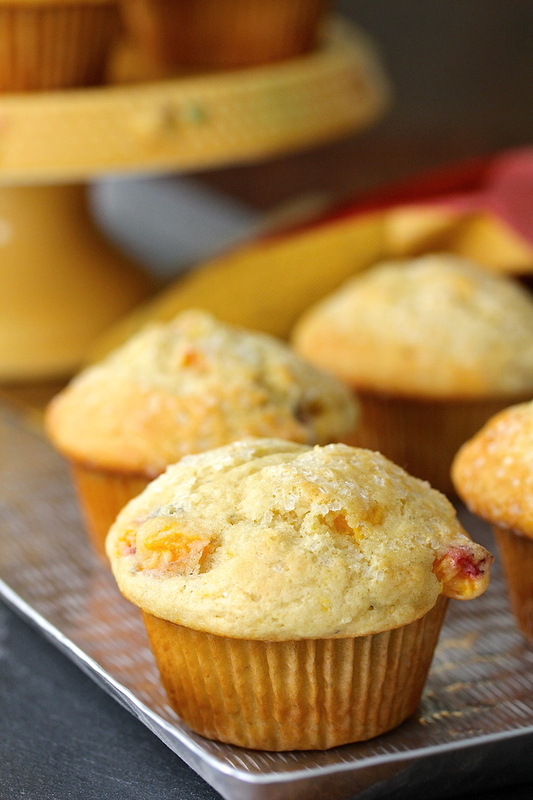 These muffins are really light and airy, and the flavor is a combination of vanilla and peach. The muffins are so moist and delicious on their own, no extra butter or jam needed. 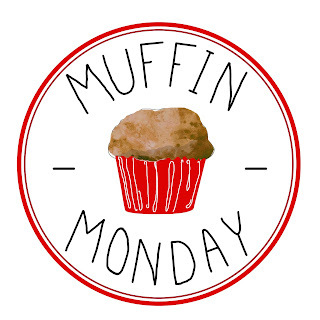 #MuffinMonday is a group of muffin loving bakers who get together once a month to bake muffins. You can see all our of lovely muffins by following our Pinterest board. Updated links for all of our past events and more information about Muffin Monday, can be found on our home page. After the recipe, check out what all of the Muffin Monday bakers baked this month. Thanks to Stacy of Food Lust People Love for creating this group, and to Kelly of Passion Kneaded for helping out this month. Preheat the oven with a rack in the middle to 375 degrees F.
Lightly spray or grease the top of the muffin pan so that the muffin tops don't stick. Place 8 muffin liners into the cavities of the pan, spacing them out. In a large bowl, whisk together the flour, sugar, baking powder, baking soda, and salt. Set aside. In a medium bowl, mix the buttermilk or sour cream, egg, and vanilla. Add it to the dry ingredients, and then add the peaches and melted butter, and stir until the dry ingredients are just incorporated. Portion the batter among the eight muffin cups. The batter will fill then entire muffin cup. Sprinkle the tops with the sparkling sugar. Bake the muffins until a toothpick comes out clean, about 18 to 20 minutes. Cool the muffins in the pan on a rack for 10 minutes. Remove the muffins from the pan, and continue to cool on a wire rack. These muffins can be kept in an airtight container for up to two days. Recipe slightly adapted from The Everyday Baker: Recipes and Techniques for Foolproof Baking by Abigail Johnson Dodge. This is a book you need. Trust me. Your muffins are lovely but that honeybee platter......now that's what I'm talking about....I want one of those. Thanks Wendy! Isn't it cute? I got it about five years ago from Williams Sonoma. I live in North Carolina--and we have some of the best local peaches (better than GA in my opinion) and I have some that need used. YUM!! Nothing beats the smell of actual ripe peaches! Your muffins are perfection, Karen, and I agree with Wendy on the cake stand. Adorable! Right Stacy? Even though I rarely bake cakes, I had to have this one. I actually bought two sizes (sheepish grin). Yummm... how I love fresh peaches. These muffins look perfectly summery! Thanks Rebekah. I bet you have plenty of fresh peaches where you are! I always love the shape of your muffins - that sounds odd, but it's hard to put it any other way, so there you go. Beautiful, perfect domes! Muffin Monday... Macadamia nut Monday... which will it be?? BTW I use my granny fork all of the time. I'd never heard of them either and then read about them in Cook's Illustrated and bought one. Love it! you are going to be responsible for my bankruptcy. And before that happens, Phil will send me to sleep with the dogs, so I can think about my actions and excessive amazon.com clicking. Glad to know we arrived in time for decent peaches to make it to Cali! We've been pretty happy with our grocery store haul - however, I do love my farmers market finds though. :) I'll have to make these muffins next week!